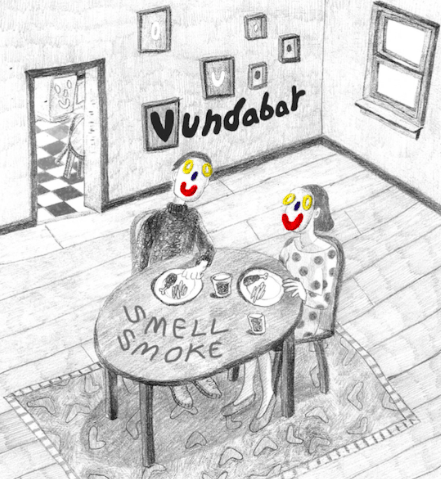 Vundabar's "Smell Smoke" sings criticisms of society. Photo courtesy of Bandcamp. Frontman Brandon Hagen crafted “Smell Smoke” as a coping mechanism to help him through the troubling times of looking after a sick loved one while on tour. His subtle, yet snide, observations about societal structures are consistent throughout each and every song. Hagen expresses his frustrations with capitalism, greed and the American healthcare system through energetic spring-back reverb guitar and a nursery rhyme structure. Despite Vundabar’s attempt at making “Smell Smoke” a fun record, melancholy feelings bleed through in Hagen’s noticeably fed-up voice. This creates an authentic collection of songs, which beautify blends earnest frustrations with tongue-in-cheek humor. Even if songs about anxiety and frustration aren’t your cup of tea, the powerful productions are worth giving the album a listen. The live atmospheric soundscapes makes the band sound bigger than they actually are. This is due to the cohesion and complementary bass lines, which produce brooding melodies through Hagen’s Fender Stratocaster guitar. Hagen’s colossal riffs and vocals bring a depth that he pulls off effortlessly. But it’s the lyrics that give “Smell Smoke” substance. “Big Funny” is a song that Hagen wrote after joking with a relative of his about how cheaper it would be to buy a coffin than pay for a medical bill at a hospital. The track discusses the cruelty and irony of America’s healthcare system. While “No People to Person,” wouldn’t necessarily satisfy the ear of a Flaming Lips fan, it still has the chaotic, loud and experimental elements of a psychedelic rock song. “A Man Loses His Hat,” takes a tune that transports listeners into the world of a man who shapes his identity over a hat, which he ends up losing; clearly carrying a deeper meaning. It has winding melodies and quite a lot of finger plucked guitar riffs that add to the tight, quiet and loud dynamics of the band. The track “$$$” is a snide outlook on how money shapes our identity. The song’s repetitive droning guitar riff and drum are prominent throughout, until eventually ending in a chaotic jam. These tracks make “Smell Smoke” worth that first, second and third listen.